Sift the flour and mix in yeast, salt, sugar & milk into a soft dough, but don’t knead. Gently knock back the dough by patting it firmly. Put back in the bowl and chill overnight. Shape the dough in a ball and cut a cross on top. Stretch each quarter out to form a sort of 4-leaf clover/cross shape. Make the butter into a patty without heating it too much (bash with rolling pin is often mentioned here, although not by Leith’s) and place in the middle of the dough and fold the leaves back over it. Roll the dough out to 20x40cm then do a business letter fold, do a quarter turn and repeat the business letter fold. Warp in clingfilm and chill for 20 minutes. Do 2 more business letter folds, then roll out to 20x40cm. Place on a lined baking sheet, cover in clingfilm, and chill until firm. Cut into 6 triangles. Leith’s says use a template, but I’m going the America’s Test Kitchen way and getting out my ruler and measuring. 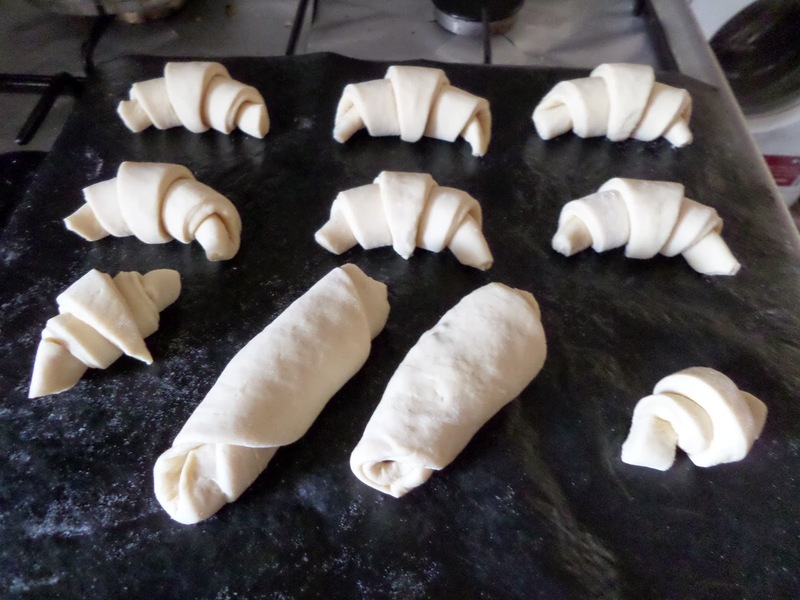 Roll up the triangles form the thick end, then form into crescent… well croissant shapes! Place these on a lined baking tray. Roll out the scraps and cut into 2 rectangles, and roll up chocolate inside, and place seam down on the baking sheet. Cover with oiled clingfilm and prove at room temperature (20C) until very puffy. Then chill for 20 minutes to set the shape. Heat oven to 210C fan. Glaze the pastries then bake for 10 minutes in the middle of the oven, then rotate the tray and turn down to 170C fan for another 20 minutes, until deep brown. 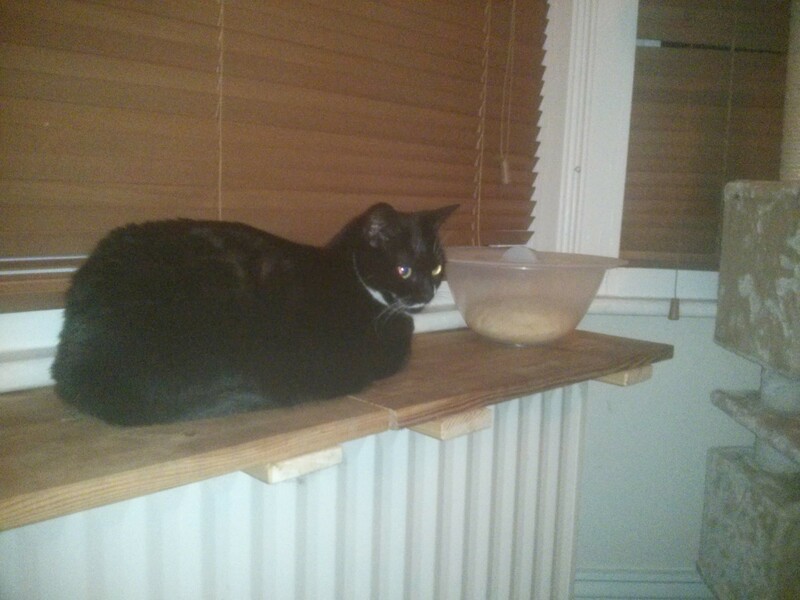 Then cool on a wire rack. However mine were looking pretty well done after the first 10 minutes baking, so I just gave them an extra 10 minutes at 170C before taking them out. 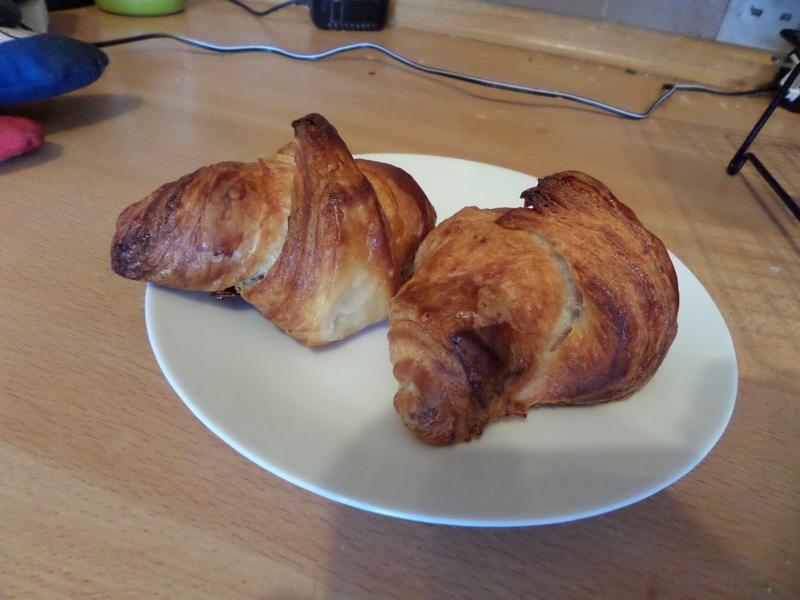 I’m very impressed with how they look: like proper croissant! We couldn’t wait for them to cool so we dug straight into them, and they tasted like croissant too! 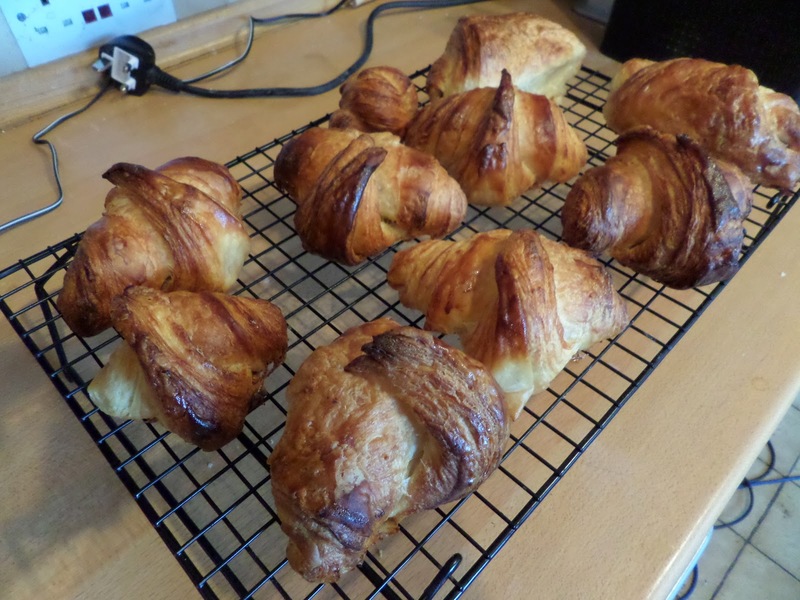 Now all I need to do is work out how to manage the preparation steps so we cn have croissant for breakfast, rather than mid-afternoon as these ones turned out!